Due to the unmatched quality and never before strength, we have been able to establish ourselves as the prominent Welded Mesh Manufacturer, Weldmesh Supplier and Welded Mesh Exporters of India. To craft optimum quality Welded Mesh the joining of wires at the intersection is achieved by electric resistance welding. All the spacing between wires are controlled by an automatic mechanism of high quality. 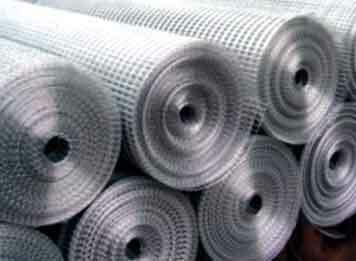 Our superior quality Welded Mesh can be used as a fence to partition specific area. It can also be used as a guard for Trees, Machines and Electric Equipments, for Floor Gratings, Poultry Protection, Green House, Concrete Reinforcement, Building Construction, Paving, Concrete Pipes and Pre-cast Components. We welcome you to avail the opportunity of reasonable prices from us and conduct a blissful purchasing. Can be used as a fence to partition specific area. It can also be used a guards for trees, machines and electrical equipments. Used for floor gratings, poultry protection, green houses, concrete reinforcement, building construction, paving, concrete pipes, pre cast components.